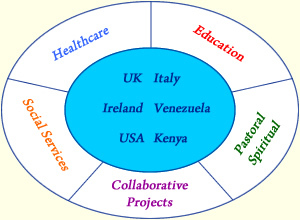 Today, we carry out the work begun by Frances Taylor in social, pastoral, health care, education and outreach work in the UK, Ireland, N. America, Kenya and Italy. Through our SMG Associates we continue her Charism in Venezuela. The Superior General and her Council, who are also the Trustees, are based in Roehampton in London.